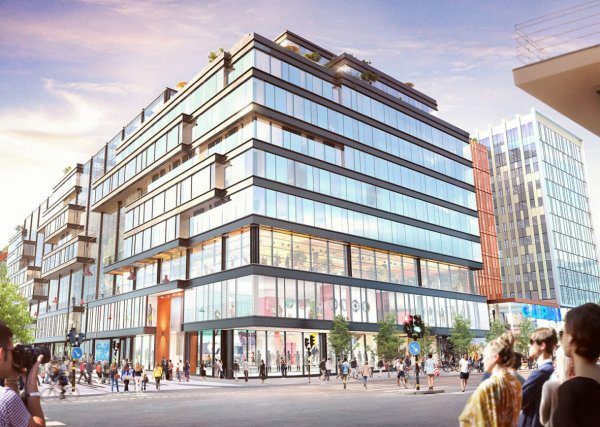 Skanska has signed a contract with AMF Fastigheter to construct a new building for commercial and office premises in central Stockholm, Sweden. The contract is worth about SEK 1.2 billion, which will be included in order bookings for Skanska Sweden for the first quarter of 2017. The project includes demolition of the existing building, ground improvement and new construction of twelve floors totaling 44,000 square meters. The new building will meet high sustainability standards and aiming for Platinum certification, the highest level, according to the environmental certification system LEED C&S. Great emphasis will be placed on logistics, security and the adjacent mall will be kept open during the entire construction period. The assignment is part of AMF Fastigheter’s development Urban Escape. The project includes an entire block of five buildings on 130,000 square meters in the center of Stockholm, and the adjoining street environment. The goal is to create an urban space with international appeal. Skanska and AMF Fastigheter have for several years worked in a number of projects, the latest in an ongoing office project in the same block. Construction will start immediately and the building will be completed in the spring 2019. Skanska is one of the leading development and construction companies in the Nordics, with operations in building construction and civil engineering in Sweden, Norway and Finland, and developing residential and commercial property projects in select home markets. The commercial development stream is also active in Denmark. Skanska also offers services in public-private partnerships. Skanska had sales of about 67 billion SEK and 10,600 employees in its Nordic operations during 2016.